Saute the onion in the melted butter in a saucepan. Add chicken and stir until it is slightly cooked. Add mushroom to the pan. Leave it for 5 minutes, then add in taragon leaves, chicken stock. Add the corn flour with a 2 tablespoon of water... mix it well. Pour the cornflour mix into the pan. Season with salt and pepper. Leave it aside to cool. Grease 4 ramekins, divide equally. 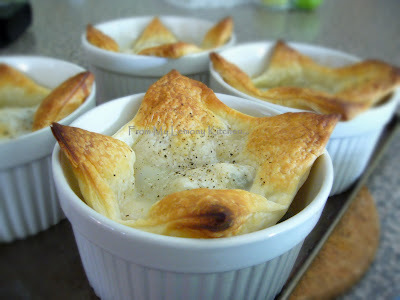 Cover the top with puff pastry and bake at 180C for 30 minutes or until golden brown.